Katie (right) and the cast of O’Malley’s “Seconds”. But we rarely give a lick of thought to the challenges that would naturally follow once we found ourselves on a new path, do we? And life would present new challenges, right? After all, we’re all prone to choosing the wrong words or making the wrong decisions. It doesn’t naturally follow that things only go swimmingly after we’ve done the right thing. 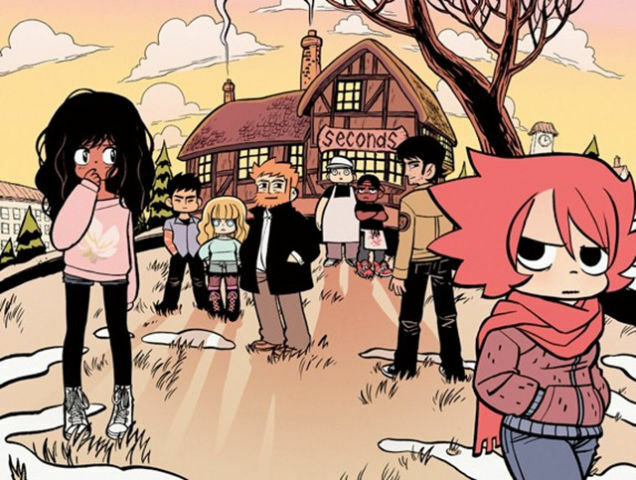 This is the predicament with which Bryan Lee O’Malley confronts his protagonist in the consistently outstanding fable “Seconds”. Katie is a youngish restaurateur who is preparing to open a new establishment after helping to open the restaurant Seconds four years prior. Seconds has been a successful venture, but Katie isn’t satisfied with being the executive chef of a restaurant in which she doesn’t have a financial stake. With this new endeavor, Katie will own half of the new business and all of the scraping and saving she has had to do will have been worthwhile. Plus she’ll finally be able to move out of the cramped apartment that resides above Seconds. One evening during a busy service, Hazel, one of Seconds’ wait staff, has a terrible accident in the kitchen that is a result of a mistake made by Katie. Later, in the middle of the night, Katie is visited by a mysterious being that leaves her a mushroom with a note and an old notebook. “A second chance awaits” is written atop the note with instructions to document any mistake that has taken place in the residence and then eat the mushroom. Ingesting the mushroom grants a person the ability to relive an experience and change things how one sees fit. Katie prevents Hazel’s accident and everything goes back to normal. Omniscient narrator: Katie was stressed out. Omniscient narrator: She was sleeping too little, worrying too much, feeling old. Katie: She was in her twenties and young and totally great. Omniscient narrator: At 29, she felt like everything was slipping away. Omniscient narrator: …and she was talking to herself more than usual. Katie feels lost and out of control. “Seconds” is a near perfect read and that is due in part to the thoroughly human characteristics he has given to Katie. She is a good person but she is flawed in the way so many of us are. She is apt to make the occasional wrong choices, she isn’t as forthcoming as she ought to be, and her buttons are easily pushed. All of these things make her a fully realized three-dimensional character. That we don’t immediately dislike her is the result of O’Malley’s amiable writing style. O’Malley’s exuberant quasi-Manga artwork is a complimentary fit for the lighthearted nature of his storytelling. The artist uses recurring ellipses that appear next to any number of characters’ heads when they are at a loss for words. There are also the sound effects that aren’t really sounds at all, such as when Katie and her head chef Andrew glare at one another with anger as the word “STARE” hovers above their heads, or when a final drop of wine drips into a glass and the word “empty” appears. These wonderful touches enliven O’Malley’s unique artwork, and they’re used sparingly enough as to not become a distraction. There are some strong details in O’Malley’s work, especially in the exterior shots of the town where Katie’s new restaurant is located. O’Malley and drawing assistant Jason Fischer have gone to great lengths to instill character into the old town, with it’s early twentieth century architecture; plenty of cracks and dimples help to inform the age of the buildings. Similarly, the cottage that is Seconds feels timeless, as though it has existed for centuries. Each time O’Malley features a wide shot of the interior of Seconds, he ensures that we see every imperfection in the wood, the worn leather of the booths, and the mismatched chairs at each table. Clearly a stickler for details, Fischer illustrates delicious looking plates of restaurant quality food that deserve to be on the cover of “Bon Appétit”. Nathan Fairbairn utilitzes fairly reserved colors for “Seconds”, minus Katie’s fiery hair or his repeated use of bright red in the background each time Katie makes a mistake that she plans to reverse. 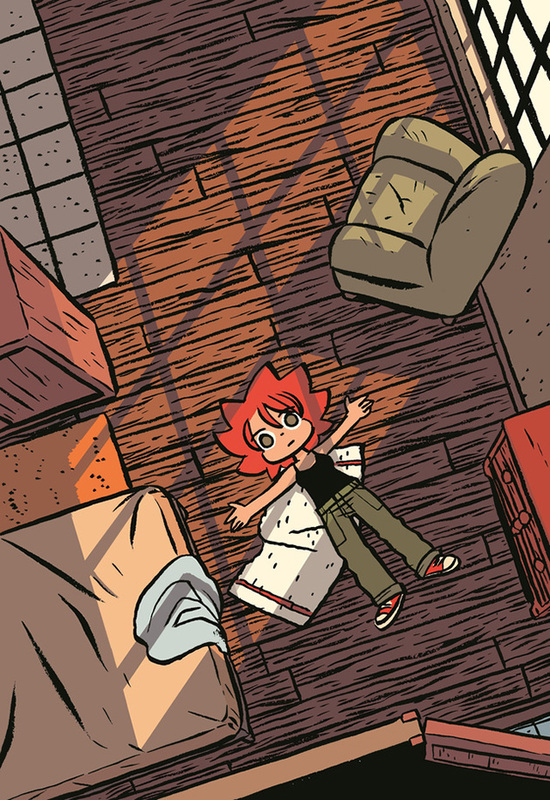 Fairbairn colors much of the book with a warm autumnal palette, which helps to give Seconds its inviting aura. The colorist uses muted reds to clearly identify the flashbacks or when Katie revises any of her blunders. This is a helpful device as it might be used for an entire sequence or just a single panel. Dustin Harbin’s letters are critical as they become part of O’Malley’s artwork for most of the narration. Having the words float within the panels, the fonts in black or white depending on Fairbairn’s colors, adds a storybook quality to “Seconds” that is befitting the book’s tone. Harbin adds some nice touches, such as including narration in the picture frames on a wall behind the characters. O’Malley juggles a handful of supporting characters in “Seconds”, but the one that needs a little more fleshing out is Katie’s ex-boyfriend, Max. He still has the ability to make Katie melt with his handsome gaze, but O’Malley only alludes to the strength of their relationship. Katie discusses her connection to Max as follows: “But we could talk. We worked together every night and the conversation never ended.” However, we never really see this chemistry between the two lovers. O’Malley shows us that they want to be together, but the magic between them remains a mystery by the book’s close. The lesson of “Seconds” is one that is relatable to just about every person on this planet. O’Malley has crafted an engaging morality tale that is destined to be pulled off of your bookshelf for multiple readings.